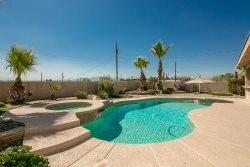 4 Bedroom, 3 Bath, located in the central part of beautiful Lake Havasu City! Close to shopping, restaurants, beaches and launch ramps. Enjoy a beautifully decorated home and relax in the private backyard with a fully equipped kitchen, covered granite BBQ area, pool, and spa.